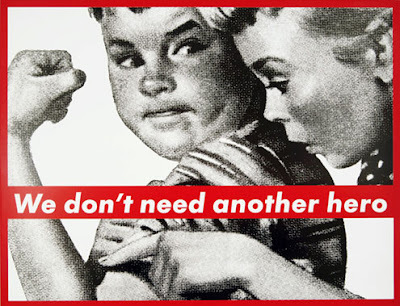 This piece of wonderful art is by Barbara Kruger. This is called We Don't Need Another Hero. Created in 1985. I absolutely love her work. She is a feminist photographer. She made this one piece on silkscreen vinyl. I love this piece. Though she is not known by most she is very talented. Her work is always titled in bold red and always a black and white photograph, making a bold statement whether against or for a certain concept. Barbara is a American conceptual/pop artist. She is bold, brilliant, and an artist who is not afraid to make a statement.Take a chance to get to know who she is, I am sure you will enjoy her!